I'm writing this from Cane Break Creek, a tributary of the Bear River, near Ossabaw Island. No sign of human settlement--no power lines, no navigation buoys, no houses in the distance. Half a bar on the cell. We spent a cold and windy day winding from creek to creek and across wide-open sounds, taking 20-minute turns at the helm and stamping our feet to keep from freezing. A pod of dolphins gave us the hairy eyeball, a U.S. Geographic Survey boat passed us, sounding the depths, and a couple of gannets buzzed us, followed by a massive Sikorksy Sky Crane (pilot and the birds doubtless trying to get close enough to snap photos of that crazy-looking boat with their cell phones). Now the excitement is over, the anchor is down, and so is the sun. 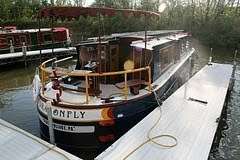 The boat is nestled close to the riverbank, which is a rippling golden wall of sea oats. We've finished dinner (spicy chili, homemade cornbread, fresh coleslaw) and we're sitting in our cozy salon, the Turkish rug warming the floor, brass spot lamps casting a glow on the Stickley settee upholstered in deep red plush. Splendid comfort in the middle of splendid isolation--as former backpackers we feel almost guilty. Crossing the line from Florida to Georgia we've entered a new phase of navigation. Up the east coast of Florida, the Intracoastal Waterway was a fairly straight course behind long, narrow barrier islands. Now, the ICW is a serpentine snarl as we move from creek to creek and river to river, all the waterways snaking and coiling in elegant wide loops. At least, that's how our path appears on the charts. From the helm, we see waterways wide as lakes. 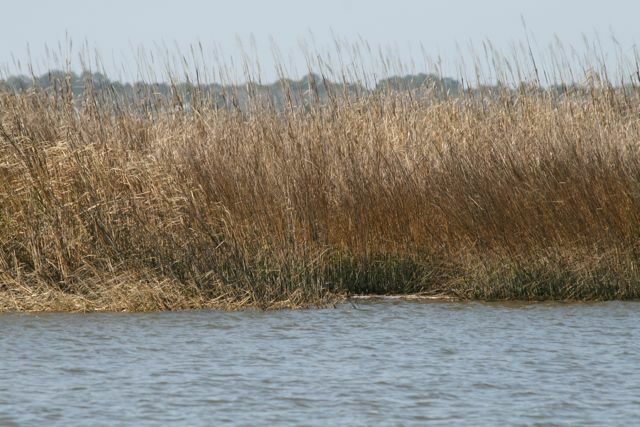 The curves and loops of the channels are invisible, submerged under a much wider layer of shallow water that spreads out into the mats of marsh grass as far as the eye can see. Early in the trip, we learned this mantra: "Stay where you're sposed to be, and you'll be fine." We keep reminding ourselves to check the charts, because what looks like a perfectly fine shortcut could hide sticky mud and sharp oyster shells a foot below the choppy, jade-green surface. On highway maps, major roads are red. Secondary roads are blue. On a nautical chart, the optimum route is marked by a thin magenta line--a dotted magenta line, actually. Mariners giving each other tips refer to it that way: The Magenta Line. Grizzled sailors with a startling knowledge of fashionable color schemes. Why magenta? I have no idea. On nautical charts, shallow water is blue, deep channels are white, shallow marshes are green, and land is tan. Magenta probably makes a nice contrast. The survey boat we spotted this morning was probably collecting date to update the nautical charts for this area--running along, checking the depth of the course along the magenta line (which is why we had to get out of the way for 'em). Contrary to what you might expect, the magenta line is NOT like a dotted line on a highway. It doesn't necessarily run down the precise middle of the channel. Instead, sometimes it trends to the right, sometimes to the left. Usually, if you stray from the line, it's no big deal . . . . as long as you stay generally within the channel (the wide white stripe) you'll be fine. Especially in a boat like ours, with a shallow draft. But sometimes the magenta line carries important information. The line may trend to the right of the channel because a river dumps in on the left and a shoal tends to build up. If you don't follow the line, you could run aground. Sometimes we learn this from our guidebooks. Sometimes we learn it because we Seek Local Knowledge. And sometimes we learn it by watching, in horror, as we float over a spot charted as 15 feet deep and the depth finder shows us 3.5 feet on the depth finder. On the other hand, sometimes the magenta line is just plain wrong. Yesterday, we crossed a sound--a wide river mouth. We could see from the chart that, on the far side, after making the crossing, we should make a sharp left turn in order to head up a tributary. The magenta line made a neat, right-angle turn . . . OUTSIDE the red buoy. Given the geometry of the route, we knew the line ought to have been BETWEEN the red and green buoys (where the line was 'spozed to be). In this case, if we HAD followed the line, we would have run aground on oyster reefs 2 feet under the surface. Although the charts are fallible, some mariners feel a fanatical dedication to running their boat precisely along the magenta line. Yesterday I was at the helm when a sailboat has approached from the opposite direction. I moved to the right side of the channel, expecting the other boat to move to its right. That's common with oncoming boats--to mimic the way cars pass on a highway. But this boat kept coming on, coming on, coming straight for our bow. I couldn't get out of the way by darting to the LEFT side of the channel because SlowBoat doesn't DO "darting," and anyway that's bad boating etiquette, to cut across someone's bow when they're so close. So I squeezed to the very edge of the channel (thank you, shallow draft!) and the sailboat charged on by. The captain has his eyes on his chart plotter rather than the water--following that thin magenta line. That sailor sounds like he needs a USPS Piloting course! It's great to see how far you've come since Christmas. Don't go too fast, it's still snowing and cold here! It just so happens that I'm currently teaching an advanced coastal navigation class for the Coast Guard Auxiliary. You might be interested to know that the reason so many items printed on a navigation chart are magenta is because magenta is visible under the "red lights" often used at the helm to avoid interference with night vision. Items printed on a chart in red would be invisible.